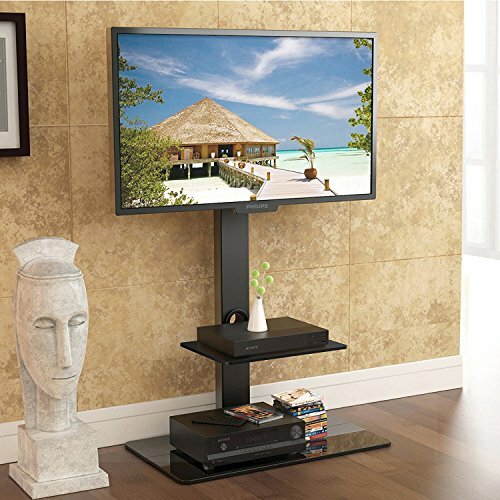 This floor tv stand with mount looks simple, elegant and won't take a lot of sapce. It is a conbination of shelf and mount, what's more, the mount can swivel , make you have a perfect view. This floor TV stand with mount is your solution.You do not need make any hole on your wall and can place it in any where of your house. It's small space size make it perfect for TV and can still hold your components and DVDs.The included mount holds up to a 65" TV and hides all your cords down the back panel. Component shelf for holding A/V equipment. The black finish adds a sleek look that shouts look at me! All while making the most of functionality. Safety locks backplane thickness of up to 2.5mm, strong stability, durable, reliable quality. This smartly designed TV stand is very simple to put together and lets you mount your TV for a clean, sophisticated look. Assembly Manual and all TV mounting hardware is included. Support VESA Size:100(W)mm x 100(H)mm up to 600(W)mm x 400(H)mm. Sleek Design! - This TV mount with Shelves creates a modern look for your audio video equipment. Smart Design! - This TV mount with two shelves adds a unique ability to swivel where others cannot. The mount will fit most tvs from32" to 65" To make sure your TV's VESA bolt pattern falls between these two sizes : 100(w)mm x 100(h)mm up to 600(w)mm x 400(h)mm. Rack can be rotated,height adjustable,fit most TVs from 32" to 65"
If you have any questions about this product by FITÜEYES, contact us by completing and submitting the form below. If you are looking for a specif part number, please include it with your message.